Getting ready for this morning's ride and I picked up my camel and almost gagged - my camel reeks! Reminded me of the same stink that I encountered at the Joint Readiness Training Center (JRTC) at Fort Polk, LA, during the middle of August 2001. I was with this National Guard unit where most of the leadership were a bunch of ex-Infantry types and thought that we should rough it for two weeks in the field without showers. Just wished they would have done the same, only they got to go back to the Bachelors Officer Quarters (BOQ) every night for a shower. When I got rolling, the stink didn't bother me for obvious reasons. Wanted to do more this morning but I was still beat from the eight mile pounding I took riding the Fixation on Tuesday. That was a fun ride but I was feeling sore the two days following the ride. Decided to take it easy and ride the 'Horse and do a quick Echo Valley Loop. Thought it would be worthwhile to visit the new roller with a little more squish. There are actually three opportunities here. Need to think of a good name for this group of rollers. Below, I have marked the direction of travel for these rollers. In essence, the color of the arrow denotes the level of skill each of these rollers requires, like what you see on the ski slopes. Of course, a more experienced rider would probably say they are all easy but for someone that might just be starting out, I figure a little color coding wouldn't hurt either. 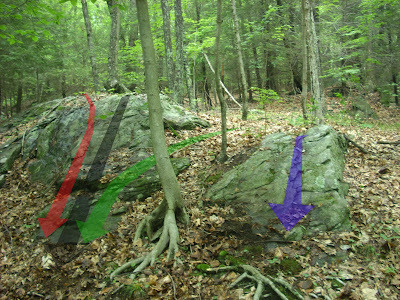 The blue arrow is the route down that I did on the Fixation on Tuesday. Between the two, I discovered later that you could get a little practice on one that is not too steep and not too high. This is shown by the green arrow. The blue arrowed roller I think is a little more difficult due to the roots found towards the bottom of the rock. The run up to both the green and blue is pretty easy. The red arrowed route is not recommended although that is what I ended up riding, by accident, in the video below. I wanted to go down the black route but found I couldn't do it from where I was initially parked. The probably was I couldn't clip in fast enough. What I really should have done is started further back. Instead, I chickened out, and then went back to approach from the other side, a little further back. I did it but it wasn't pretty. I need to clear a path to this one, which I think will work better. Also, behind the red and black routes, there might be another roller that would be fun to ride. When I have more time, I will try to define that route, as well.